I woke up.. saying a prayer, I got dressed... saying a prayer, I drove to work early...saying a prayer, I planted tomatoes this morning...saying a prayer. I'm sitting at my desk...saying a prayer. No wonder I feel so Blessed!!! Happy Birthday To Me!!! Today is Mother's Day and I am happy! My hubby surprised me with a huge pot of Bromeliads (3 humongous plants)before he went to work this morning. I just got back from Olive Garden where my "kids" took me for lunch/dinner early. It's crazy out there now. We had a great time there. Then they humored me and we went to see my garden at the office downtown..lol. They loved it!!! So now we're resting for a bit. My daughter and I are watching David Tutera/My Fair Wedding, before we start Monopoly at 5 p.m. We love board games and video games. Now that's my idea of a Happy Mother's Day!!! Good Afternoon Everyone!! I'm so excited. 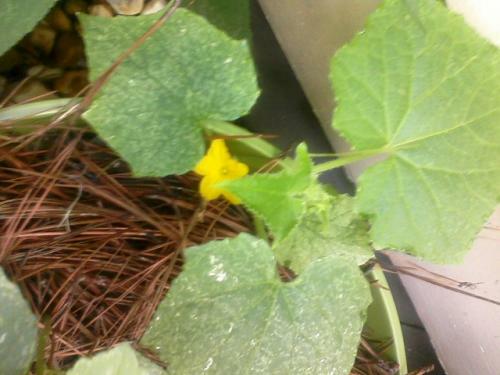 I have a cucumber blossom today!! I have green beans about a half inch long but something's eating my leaves. Everything is growing so nicely. I do see that I really really need to pot those other tomatoes and peppers because they are really tall now. I'm just so proud of the babies. To watch them grow has been so rewarding for me already and I haven't even tasted the first anything from back there...LOL!!! My co-worker just told me that I am having so much fun this year with the plants. I'm sitting here at my desk surrounded by papers and I'm smiling because my background on the puter has a shot that i took this morning of the yellow hibiscus and it takes me to another place..one of peace and calm. That's what gardening is all about to me..peace and calm. Having a Great Day!!! For you all who don't know, I cherish mornings because that's my time to reflect and just exhale. Take in the wakening of the flowers and sounds. This morning at 6 am, i was in bed and looked over towards the window and the sun was coming up and immediately, I just smiled. I suddenly remembered how i loved this time of the day when I lived in my house in the country. I would get my coffee and go sit outside on the steps before the sun really came up and take in the smells of the morning. Then would come the hummers to feed. Oh man, do I miss that!!! The buzzing, the fighting. Hence, my nickname and tattoo!! Then after about 10 mins, I would always, always take a walk around the property to see what was new and to talk the plants. Back then I had 2 acres but 1 for plantings. The spiders would be busy at work, the lizards (my buddies) would be scurrying all over the place, birds playing in the birdbath. The flowers seemed to smile at me as I walked by..it was as if they were waiting on me. I would wave to everyone who passed by and honked and those who didn't. I was told later that i was a fixture out there. They could always depend on me to be out there when they passed to go to work. I was told that they actually enjoyed passing by to see the yarden because it brightened their spirits. That place was a public garden in the making. With those memories, which are so vivid, I can't help but smile as I lay there. My hubby still cannot believe that I actually go up early this past Saturday just to go see my plants open...I told him that he doesn't understand yet but he's getting there. He said that he is starting to understand and just shook his head. This moment is when i truly know that I belong in the yard wanting to make people smile. So I got up got myself ready, have already eaten my breakfast and wanted to sit and write and share my reflecting moments with all of you because I know that you understand. For the moment please follow my pics on "My Garden"..still haven't learned how to link yet. Help someone!! May 1, 2012: I'm At Peace Now!!! Well it's been an interesting month. I've had my colonoscopy (clean bill of health), 1st Wedding Anniversary and my son move back home: all this past month. I have to say that I have never watched over and prayed over plants as much as I did my little beauties. That was fingernail-biting and nervousness all rolled up into one. My goodness to get them outside for the first time was crazy for me. Since the last time I was on here, I was trying to find a spot to put my babies. Well, after much thought/prayer...i ended up placing them out at work..lol. I really did like the space after he put the rocks down and then it was taking soooooo long to find someone and that in itself was nerve-wrecking. So they are doing wonderfully out back and seem to be happy. People have commented on the space and love it...i give my boss credit for the rocks and he gives me credit for the creativity...lol!!! I've done a lot and spent a lot of moola back there on plants but have enjoyed every minute back there. I will be posting pics so I can catch you up to date. My tomato and pepper plants are as tall as the ones from the nursery. I am so proud of them. The greenbeans have gone on about their business. The roses have budded and i expect that they will open by the end of the week. Getting the camera ready!!! Have a few more specific plants that I want...trying to draw the bees. It's so hot here already 90's (86 today at this moment)!!! Moving on to last night!!! I finally told my hubby what happened earlier in the week. Now just a little background on my husband...speaks his mind..holds no punches!!! He said if i were you...i wouldn't open up the door and take another step back there...all that work and time that you put into making that area something that all of you can be proud of after sitting there for 30+ years... (--ck Him) Then he said but i know that you already have plants back there...i wouldn't take anything else back there...find another place for your plants...I hate people who are like that especially him, he said. They have a word specifically for him and no one has used it in a long time....he's a chauvanist. He said that that word describes him to a tee and when he said it....I said that's it!!!! Then he also said that he's the type of person whom you have to show him rather than talk to him. When he figures out that you're not going back there...he'll come to you and ask why are you not going back there. But he also said that's what he would do, not necessarily what i would do...however, after the lack of feelings that i had for the area yesterday, i think that he is on to something. That was my AH HA moment!!!! Just take them to a garden somewhere else as some of you have suggested. I got up and went there this morning at 8 and potted 2 plants already there and just stood there for a moment....it really really did not feel like the space that i drempt about because all around the area i saw "his" area. I always knew that I was passionate about gardening but this is the first time that my creativity/vision(s) Has/have been clouded. So I guess it's true...don't mess with an artist while they're creating that masterpiece. Well, ladies and gentlemen..I am searching for a community garden as we speak..As you see i have a lot of seedlings to plant or give to someone....the last thing I need is to argue over a space that was supposed to be peaceful. I'll just move on!!! Thank God For My Hubby!!! 3/31 My Ah Hah Moments!!! I have a lot to say this morning after yesterday's conversations. I truly believe certain people are placed in your path for a reason. I had a conversation with someone who was totally unexpected. It was as if he was bursting at the seams to get out his frustrations. Just so happens that that person wasn't at work yesterday so we went out in the "garden area" and he told me the pricing on putting in that path that I blogged about earlier. Well let's just say that I know the boss and his stingy ways and he will not pay 1500.00 for that path. Well we both agreed on that issue. Then we start conversating about what transpired a few days earlier. I didn't bring it up...he did because he was right beside me. After a long conversation with him, he said that he saw how my boss totally ignored what I was saying to him and kept on going with his idea and everything that you tried to tell him wasn't going to work, he didn't want to hear it. He told me that he saw the hurt in my eyes because he saw my vision disappear in an instant. He told me that we both know how he is and that it would not have done any good to say anything because he does not listen to women. When he said that....I ran around the building because I knew at that point that i was right all along but had never heard it from anyone close to him. He also doesn't listen to people who are not at his level financially. Oh My God...I have been waiting to hear that from someone else thinking it was just me. I told him that I feel as though my dream was stolen or crushed in an instant and as we stand here in this space right now...i can't think about what i should do next because my dream was invaded. It's as if the switch turned off. I told him that working here is not my dream..but working in gardens and creating them are and the boss knows this. I can't tell you all how free I felt speaking to someone who understood exactly what I was feeling but them letting me know how they felt. He actually feels used like I did. He told me to never let anyone steal your dream and never let anyone hold me down. He is a gardener to his heart and he understood..it was as if i was saying those very words....THEN something hit me....he doesn't appreciate the work that i've already done to just come and take over ...spoke volumes to me. 3/29/12 Feel Better - Letting Go!! This morning I am feeling so much better about the "used to be" issue. It's not anymore. I decided it wasn't worth saying anything and just going with the flow. Besides the reasons why I do this is not for cosmetics it's for the passion. I think what really made this all blow over was what greeted me when I got home besides IVAN the cat...remember the cucs, watermelon and green beans I just seeded Sunday? Well they are up and out..that made my whole day and actually made me realize that at that moment all the tension of the day went away when I saw that. So now I'm excited again to continue watching the seedlings grow. The ones that I transplanted this past wknd are doing well....gotta give them some weak fertilizer though this wknd. Thank you all for your responses because they sure help take me through the day...I Love This GARDENSTEW FAMILY. Til Next Post!!! Have A Great Day.